PoNY 2.0 is designed to give deeper and ongoing professional support to all PoNY Playwrights. After the Fellowship year, PONY 2.0 provides artistic homes for PoNY Playwrights and opportunities for their work to be seen in front of audiences. The American Repertory Theater at Harvard University (A.R.T.) offers access to A.R.T. 's theaters, graduate actors, staff, as well as resources from the University: onsite residencies, access to libraries, courses, and professors. Labyrinth Theater Company offers PoNY Playwrights a place in their community with access to their Summer Intensive and Barn Reading Series. The Bush Theatre in London provides a PoNY Fellow with a play commission to be developed through creative R&D, collaboration with British artists, and engagement in the creative life of the theatre during a month-long London residency. 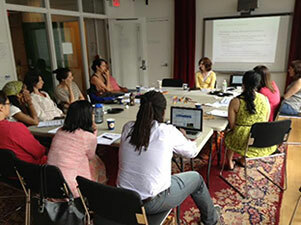 PoNY Playwrights have the opportunity to attend yearly intensive workshops led by financial experts to help cover financial and career planning in an effort to empower their careers. Led by Elaine Luttrull, founder of Minerva Financial Arts and author of Arts & Numbers. The bootcamp is tailored to the financial needs of artists, and has thus far received rave reviews from all participants. Read more about Financial Bootcamp. Each PoNY Playwright can access this grant fund to pursue opportunities that would further advance his/her career. The PoNY Express Fund can cover travel costs, professional development, the care of dependents, and more. Read more about the PoNY Express Fund.